Mod tools make the world better, says Bethesda's community manager. Elder Scrolls developer Bethesda has confirmed that it will release a new set of mod tools for the upcoming fifth game in the series, Skyrim. Bethesda has a history of encouraging player-made content, stretching back nearly ten years. Writing on the official Bethesda blog, community manager Nick Breckon joked that science had proven that mod tools made the world just that little bit more special. Not only did they make modders happy, they also made players happy because they got more content for their games, and it made the developers happy to see the modders gain experience. The new tools will be called the "Creation Kit," which refers to Bethesda's new Creation engine, and is rather apt, considering what they're for. Breckon said that he didn't have any more details to reveal about the kit right now, other than the fact it existed, but said that the tools would be very powerful. Modders have used Bethesda's tools for Morrowind and Oblivion to create new dungeons, new items, new playable races, and even entirely new features like dancing and smoking. Hopefully the new tools will be just as versatile. 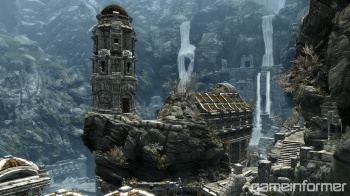 The Elder Scrolls V: Skyrim comes out for Xbox 360, PC and PS3 on November 11th.